Knowing your brand story—who you are, why you exist, and how you help people—is one thing. But learning to effectively articulate that story through content is a whole other ball game. That’s where we see most brands get tripped up. Sometimes this is because they simply have no sense of identity, but more often they lack the skills to translate the story from a document on a server to the creative content they produce. This is why there’s so much weak content marketing in the world. Without story, there is no cohesion. It’s hard for people to decipher who you are, and it’s even harder to get them to engage in conversation with you. And, of course, that’s what content is really all about. Content is really just the vehicle; story is what sticks. The good news is there are more ways to tell your brand story than ever—especially through visual content, which helps you communicate in ways that are scientifically proven to help you better connect with people. For example, with video, you can capitalize on emotional contagion (when our emotions mirror what we see on screen). With voiceover, you can trigger neural coupling (when our brain activity mirrors what a speaker is saying). And in any piece of static content, a well-crafted narrative featuring a problem/solution captures interest and evokes emotional responses. These emotions are the key to creating a relationship through content—and they will ultimately influence people’s buying decisions. (A University of Iowa study found that patients with brain damage to their emotional-processing centers had difficulty relying on logic alone to make decisions; they needed an emotional element to help them choose.) But to tap into those emotions, you need to tell a strong story. To clearly communicate your story, you need the foundation and the tools to do so. We usually see brands that have done some of this groundwork, but you need all three of these elements to produce creative content that really connects. 1) Marketing personas: Do you know who you’re talking to? You might say females 18-34, but that isn’t nearly specific enough. To bring these people to life, you need detailed personas that outline everything from how much money they make to the type of podcasts they listen to. Those are the details that will help you frame your brand story in a way that people will understand. (For our own content marketing, we have three distinct personas that we use to vet blog ideas, which has been tremendously useful. These help us hone in on the most interesting subjects that provide value to the people we’re trying to reach.) If you don’t have personas, try our easy step-by-step guide to build them. A strong verbal identity framework gives you a flexible messaging strategy to adapt to different contexts and channels. If you’re not sure if your visual identity is comprehensive, learn more about the 4 things you need in your brand style guide and see an entire visual identity built from scratch. So how do you really put your story into your creative content? This is one of the most common mistakes we see. Marketers try to cram in as much as possible to “make the most” of their content. But that only muddies things more. It’s either so dense no one wants to go through it, or it’s a barrage of messaging that’s difficult to decipher. You should have your messaging framework in place, so make sure that every piece of content supports one messaging pillar—and one only. A strong story is clear, simple, and straightforward. When you really distill what you’re trying to say, even a single tweet can tell a story. 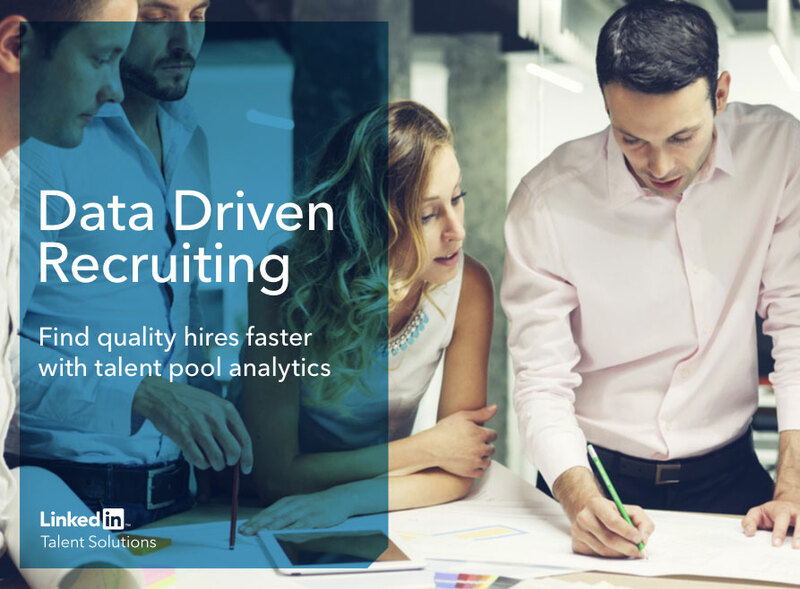 Example: We helped LinkedIn create an e-book on Data-Driven Recruiting, which communicated a single story: how data helps you find quality hires faster. For LinkedIn, a company whose mission is to make professionals more productive and successful, it was a natural narrative. No one will engage with your creative content unless it interests them in some way. It may be educational, inspiring, or simply entertaining, but they must have some desire to proceed. When you’re crafting any story, remember it’s not about you. The story you tell needs to directly relate to them. This is where personas come in. What do the people you’re trying to reach care about? What struggles do they face? What helps them? There are many ways to approach a story. Your job is to find the most compelling hook. Example: We collaborated with yoga accessory maker Manduka to create an infographic guide to finding your “soul mat” (aka the best yoga mat for your lifestyle). Manduka’s fans are yoga enthusiasts who are inherently concerned about their practice and the products they use for their practice. Instead of creating a standard sales brochure detailing the many types of mats available, the infographic educates readers about the different types of mats to help them narrow down their choices. This approach provides tremendous value in terms of decision-making. Every brand persona is different. You may be an “authoritative expert” or a “friendly resource” to people. Regardless, this always influences how you communicate with them, including the words you use, the tone you take, and the way you present stories. People want to know you’re human and that you understand them. Example: We worked with Girls Who Code to launch The Popcorn Project, a unique brainstorming exercise to help young girls accomplish their goals. As such, we didn’t ‘“implement a goal-oriented strategy with a community group.” Instead, we encouraged girls to “break down your goals into bite-size steps” and gave them the simple tips to do so. Your voice is only one aspect of your identity. People also judge you by what they see. In creative content, which is often visual, it’s important to reinforce your brand story accordingly. That means eliminating dull stock photos and using creative design to help enhance the story. A strong visual language helps you stand out and showcases your creativity, which helps people get to know who you are and what you’re into. Example: To add a little brand personality to krochet kids intl.’s annual report, we made it an interactive experience—with a twist. Because the brand is a conscious clothing company, we used thread to make tactile data visualizations depicting company info, then photographed and animated them for the interactive. This made the content more interesting, of course, but more importantly, it helped communicate the company’s story. One of the truths of being a human is that we make mistakes. The best thing about mistakes is learning from them and, if we’re compassionate, helping others do the same. When you’re a brand, you’re bound to make mistakes. These can be as silly as a mixup in the office or as significant as a major product recall. Regardless, approaching your content with honesty shows that you have high standards and want to be held accountable. Even better, you can often incorporate these lessons into your creative content, making them a part of your brand story. Example: We’ve made a mistake or two in our time, and after much reflection, we’ve always tried to come away with a solid lesson that helped us grow. Whether it’s detailing the worst video mistakes we’ve made or creative lessons we’ve learned, we try to turn our hard-earned knowledge into valuable advice for others. Everything you do is an opportunity to share not just what you do but why you do it; it’s an opportunity to show people who you are. Giving people a peek behind the curtain brings them into your world, so look for opportunities to do so. You might do a Twitter poll when you’re struggling to choose a product color. You might give people a factory tour on your Instagram. These little things are a big part of your brand story. Example: Shenandoah University is dedicated to helping students achieve success. To find out how well they’ve done that, the school surveyed students and alumni about where they’re working, what they’re earning, where they’re studying next, etc.. They then visualized the results in an interactive, giving prospective students a transparent look at how well the school has provided a foundation for success. Your brand story isn’t set in stone. Every piece of content you create is another tiny piece of that story, and it will always evolve. Your job is make sure it’s evolving in the right direction. Try these 4 ways to make more engaging content. Learn how to create content that provides true value to your audience. Still feel stuck? Let’s talk about it.